Why would I need self storage in Lake Oswego, OR? There are a variety of reasons why you might need self-storage in Lake Oswego, OR. How much is a storage unit in Lake Oswego, OR? The cheapest storage unit in Lake Oswego, OR is $33.00 per month. What size storage units do you have available in Lake Oswego, OR? In Lake Oswego, OR we have sizes that range from 4'x5' to 10'x30' to suit your storage needs. How much is it for a 4'x5' storage unit in Lake Oswego, OR? The cheapest 4'x5' storage unit in Lake Oswego, OR is $56.00 per month. Lake Oswego is a highly desirable suburb of Portland, surrounding the expansive, 405-acre Oswego Lake. It's a scenic community with a wide range of amenities, including a varied collection of recreational activities and public parks. Although the city has been growing at a steady rate, it has remained a tight-knit community with a strong sense of local pride. The area around Lake Oswego has a rich history that dates back before European explorers settled in the region. At one time, the Clackamas Indians occupied the land. Albert Alonzo Durham founded the town in 1847. He named the town after his hometown in New York and built a sawmill on Sucker Creek, which is now Oswego Creek. This sawmill was Oswego's first industry. When iron was discovered in the Tualatin Valley, the Oregon Iron Co. hoped to turn the area into a bustling steel town. However, the iron industry fell apart and Oregon Iron and Steel considered land development instead. The construction of the power plant on Oswego Creek between 1905 and 1909 proved to be a turning point for the city. The population continued to climb, and the city of Oswego was incorporated in 1910. Construction of residential houses around Oswego Lake boomed during the 1940s and 1950s. Part of Lake Grove was annexed in 1960, and the city officially changed its name to Lake Oswego. Lake Oswego is home to many young families, attracted by the city's convenient location near Portland and many amenities. Local events like movie showings in the park, a weekly farmers market and summertime concerts offer plenty of opportunity to meet people in your new community. 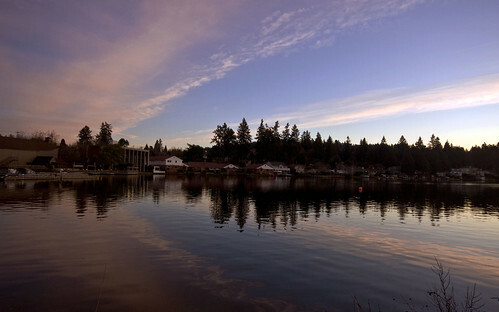 You'll also find a number of parks and recreational facilities to enjoy in Lake Oswego. There are more than 570 acres of open spaces and parks across the town, including a swim park, a water sports center located on the Willamette River and a public golf course. There's also an adult community center that provides senior-focused activities and an amphitheater that hosts local concerts and performances. The Oswego Lake Country Club is a large private club in the city, located next to Lake Oswego Hunt Equestrian Center. Lake Oswego School District provides public education for students living in Lake Oswego. There are also a few private schools in the area, including preschools, Montessori schools and faith-based campuses. Along with the public schools, Lake Oswego is also home to Marylhurst University, a private liberal arts university that offers undergraduate and graduate degrees, as well as several professional certificates. Utilities: The city provides water and sewer utilities, while Portland General Electric and Northwest Natural Gas supply electricity and natural gas to the area. Garbage and Recycling: All single-family homes in Lake Oswego receive weekly trash and recycling collection services, as well as yard waste pickup. Transportation: Lake Oswego is part of the TriMet transit network, which provides convenient transportation throughout the greater Portland area. Pets: All dogs must be licensed within 30 days of moving to Lake Oswego. Because Lake Oswego is such a desirable community in the greater Portland area, home prices are fairly high. The median home price is well above the national average and also higher than the Portland metro area average. There are many Lake Oswego homes priced above the million-dollar mark, situated on generously sized lots with lush landscaping. You'll also find a number of rental options, including comparatively affordable apartments and townhouses. Our lowest priced units in Lake Oswego, OR average $40.75 per month. 162 people have reserved units in Lake Oswego, OR in the past 30 days. There are 4 locations within Lake Oswego, OR's city limits.